I have borrowed today's poster from one of my favorite writing and marketing sites. Copyblogger is always innovative, always has helpful content and is never afraid of really teaching its readers how to improve writing and marketing skills to achieve success. Nothing is more irritating than the teasing promises made by marketers who then go on to upsell a second /third/fourth piece of magic information that you must have to achieve that five/six/ten figure income. Yeah. Right. But sadly that's not how it works. It works like Christmas. The secret lies in the loving--loving what you do--and the believing--believing you can do it. The most appealing writing conveys a message, comes from the heart. It speaks to the reader and fills a need. Think about the writers you love. Ask yourself why they appeal. Then forget the pie in the sky dream of a six figure income. Just write for the love of it. I have had a wonderful year thanks to the kindness and support of everyone here and in my other writing communities. I have read so many wonderful books and short stories, won awards and even wonderful gifts in blog give aways. Here at last is the long promised summer photo of my dearest Woody bookworm with two of his favorite mystery reads. .
Woody is a lovely eco-friendly bookmark creation of the talented Elysabeth Elderling. He loves reading real books but, as you can see from the rolling eyes, is not so good at having his photo taken. 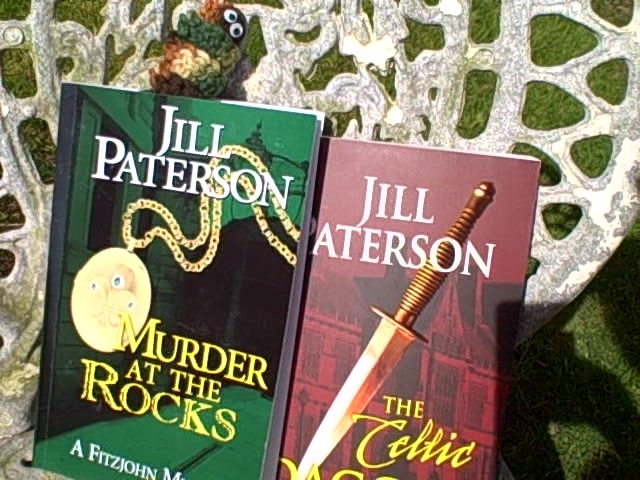 The Celtic Dagger and Murder on the Rocks introduced me to a new Australian detective series. So many thanks to Jill for providing me with the new stories--another blog win--wow!--, new settings, and a new sleuth to keep looking out for..
Wishing us all the happiest and healthiest of New Years and may our writing dreams come true. Missing in action with a broken arm and worse, broken internet when trees felled the line in the November storms, she's hoping to do better in 2013. Anne, love connecting writing with gifts, especially the gift of Christmas. It certainly has brought me lots of joy! Off to brush up my reviewing style. Maggie's is wondrous--a hard act to follow. Annie, I love that infographic! Copyblogger is a great site. And, Elysabeth does make great bookmarks - love the Woody photo also! He's a really cute bookmark, Karen. Such a creative idea from Elysabeth. Annie, love the post. To reach your writing dreams you have to WRITE! Agreed, Mary Jo. That's my target for this year hehe. Have spent too much time editing and none on the creative writing. Going for 250 words a day--surely I can manage that! Anne, I really enjoyed your post. It was informative but had a delightful feel to it, too. Happy New Year and wishes for great success! Thankyou Kathy. And the happiest and most successful New Year to you too.